Several processes, in both hardware and software, are hard at work to allow you to have a complete and safe recovery from power fails. First, a Maccor data file contains information that allow tests to resume from the most recent record stored in the file. Second, all systems presently supplied by Maccor have power fail detection hardware. Thus, by correctly installing a UPS, the software shuts down the system in an orderly fashion to allow the system to recover with no loss in data. The power fail detection hardware does more than just monitor the incoming AC. The power fail detection hardware also monitors the voltage of the logic power supplies preventing systems from damaging the devices under test. Shelves for the cabinet's interface are available. Shelves reduce the cabling needed by allowing you to test the devices at the tester interface. The coin/button cell holder is adjustable for a variety of cell diameters. With a thumb screw terminal on one end and a spring loaded terminal on the other it makes perfect contact every time. These cell holders are mounted on a circuit board and plug-in directly to the cabinet's interface. 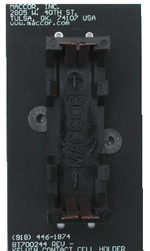 The first and only true four-wire cell holders are available in a variety of sizes including: AAA, AA, C, D, and 9 Volt. These cell holders provide the most accurate measurements at the cell. Cell holders are mounted on a circuit board with either power pole or phoenix connectors. Cables are Four-wire terminated with power-pole for tester interface, and your choice of alligator clips, spade or ring lugs, banana plugs, or kelvin clips for user interface. Product or service queries ?